PicFinch - Creative Media is a small agency with a team of creatives who have so much love and passion for design. We work with each client on a personal level. We are experts at creative problem-solving and we take the time to develop thoughtful design strategies. Our focus is on developing brands from the bottom up, as well as supporting and improving existing brands for clients in all industries. We have a hands-on personal approach with our clients, and we believe in the importance of building and maintaining strong relationships. Each project is unique and an exciting challenge for us. Our mission is to "create and inspire" through our design work. Our design work delivers value to your business. Let us help your business grow. Our services include: Brand Development, Design, Photography, Video Production, Illustration, Web Development, Internet Marketing and Social Media Management. PicFinch Specializes in Brand Identity Design, Graphic Design, and Photography. At PicFinch - Creative Media we truly love what we do, and we want to work with you, to bring you innovative design solutions that fit your goals, your timeline, and your budget. Our mission is to help you build your brand into something that shows your business' unique personality, and help you stand out from your your competitors. Our client Georgia Rappleye founder of MunSun Retreats came to PicFinch - Creative Media to help her create, design, and develop her brand. Her vision for MunSun Retreats is providing a space for women to get together, have fun, and support each other. 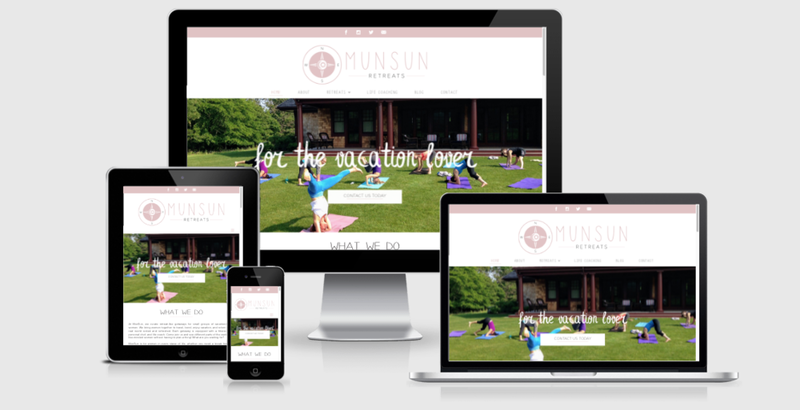 "At MunSun we create curated experiences for women looking to go on an adventure, have fun, and be inspired." Georgia wanted the brand to be all about taking time for yourself and meeting and supporting other women. It’s young, inspiring, and adventurous all mixed into one. A key element was to add the sun and moon symbol into the logo design. Our process always starts with an initial consultation to find out everything there is about our clients business. We also have our client fill out a very detailed questionnaire. Next we research everything about our clients business and there competitors. We brainstorm our ideas and sketch them on paper. Once we have come up with a few ideas we next translate our ideas in illustrator. Once we are happy with our design concepts we present our ideas to our client.